Ah, home sweet home. This week marks one month since we moved into the house we now affectionately refer to as River House (even though the “river” that supposedly runs behind our house is currently only a dry creek bed. I’m sure the massive El Niño they’re predicting for this winter will take care of that in no time, though). 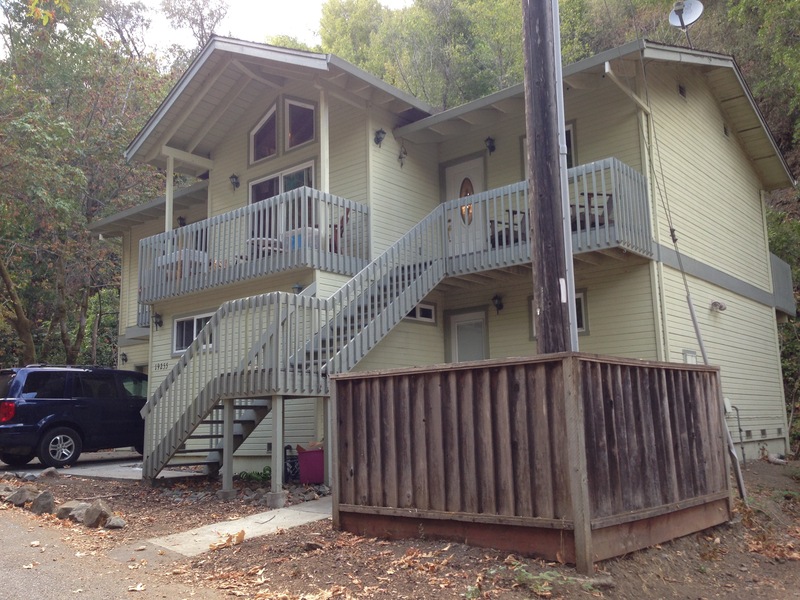 It was a bit of a gamble moving out here–we’re getting a steal of a deal on the rent (by Bay Area standards, not by normal human standards), but the house is in the “mountains” (Californian for tree-covered hills). Even though it is physically quite close to civilization, there is an absolute feeling of remoteness. Though only two miles separate River House from town and the rest of Silicon Valley, the two places sometimes feel like they are worlds apart: Mountain people drive trucks instead of Ferraris; in the mountains you hear crickets and cougars (yes, large wild cats share our property) instead of The 101 or 85; in the mountains your gardener is Jesus, not Jesús from Ramirez Brothers Landscaping. And even though we’ve only been here for a month, I kind of love it. I know you’ve all been curious to see what life is like out here in the boonies, so here’s a peek inside our little mountain life. 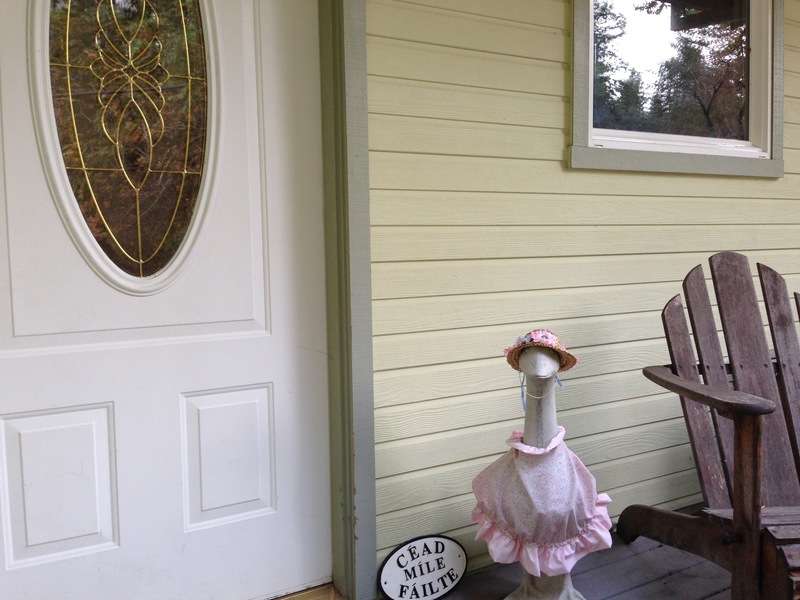 We are probably the only house in the mountains (or anywhere, for that matter) that has a large cement goose wearing a dress and an Irish welcome plaque at the front door. You really can’t miss us. Once inside the threshold you enter the Great Room. Turning left you’ll see our living room and school corner. 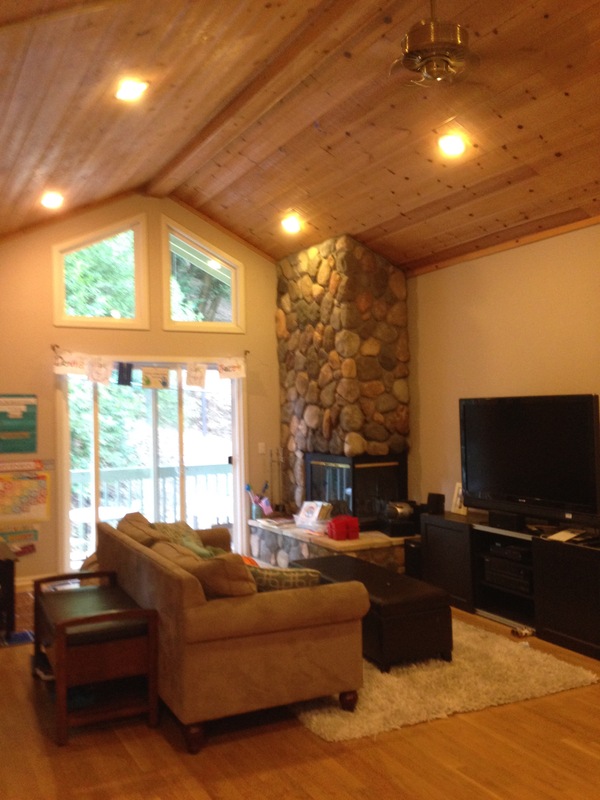 My favorite part of this room is the massive vaulted cedar ceilings and the river rock fireplace (we’ll talk more about the necessity of that fireplace in a moment). 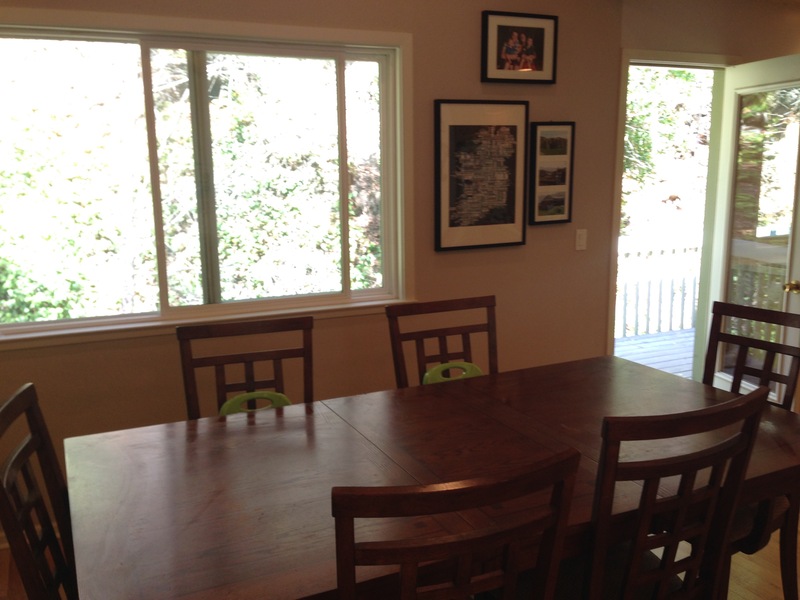 To the right of the living room is the area we’ve set up as the dining room and, beyond that, the kitchen. I love our kitchen at this house! It’s spacious and bright and, as of last week, fully functional. See our brand new fridge? This was a gift from our landlords two weeks after we moved in…after our old fridge died. 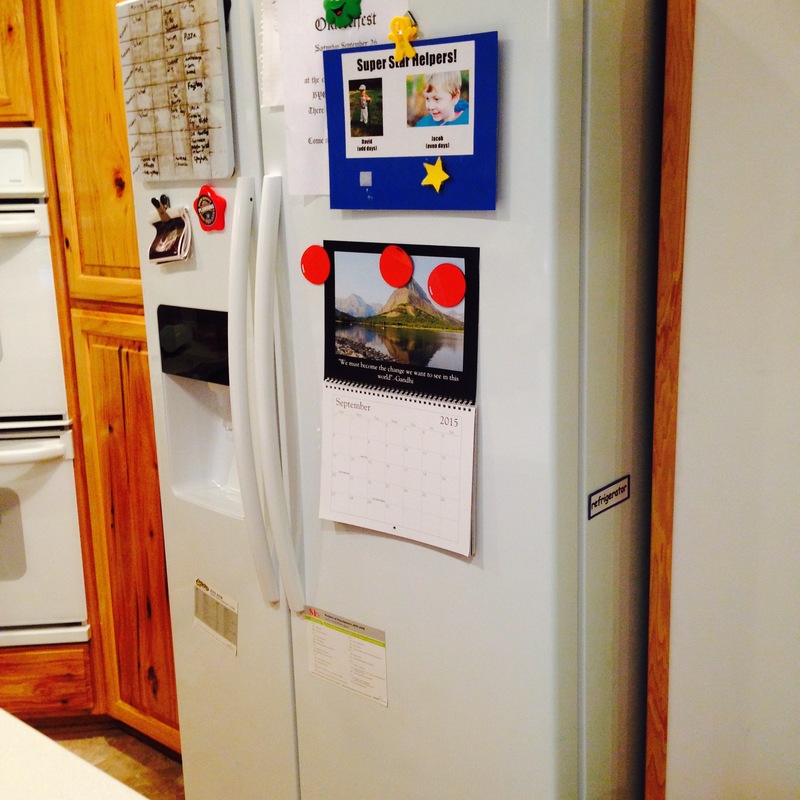 We went 4 days with no working fridge which made storing food and eating fresh food a bit of a challenge. 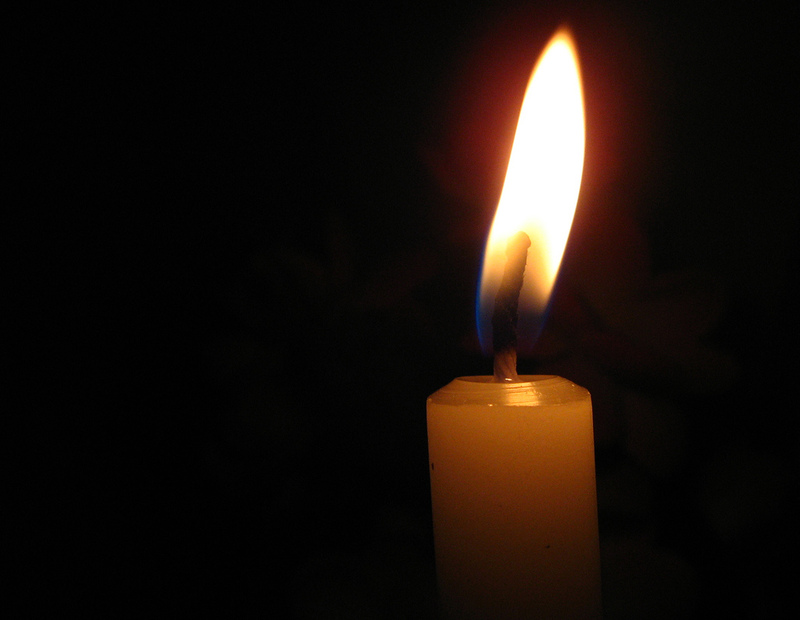 The ordeal gave me a greater appreciation for my pioneer ancestors. With the help of our generous neighbors offering us space in their fridge and a chest freezer in our garage, however, we persevered and survived the Great Fridge-pocalypse of 2015. 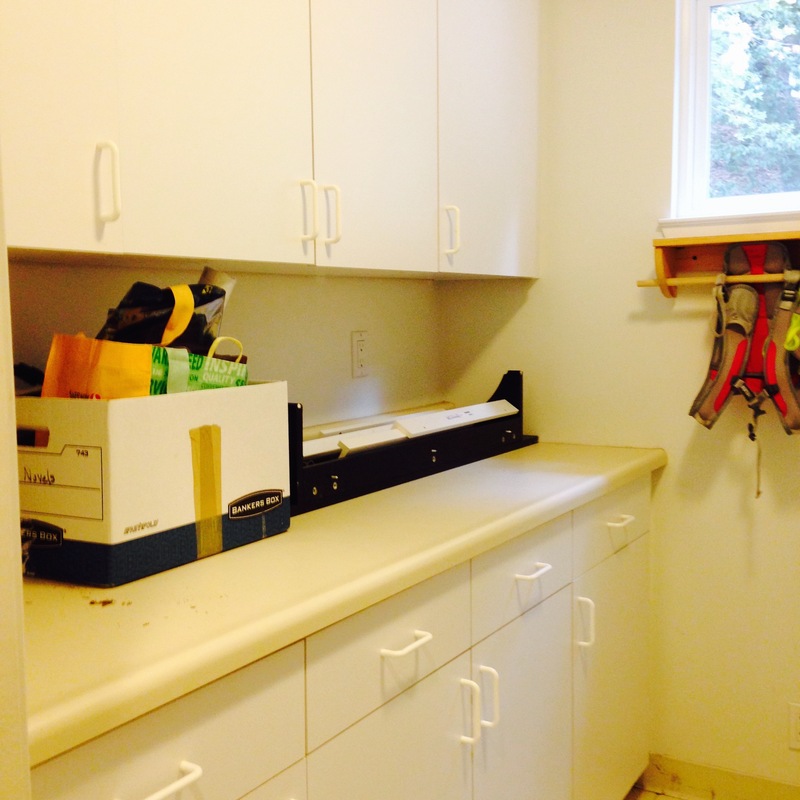 The kitchen is so spacious that I actually have empty drawers and cabinets–and that’s saying something considering we own such obscure kitchen gadgets as an apple-peeler-corer-slicer and a Turkish coffee station. Remember how we’re living in the mountains, and it’s full of wonderful surprises? 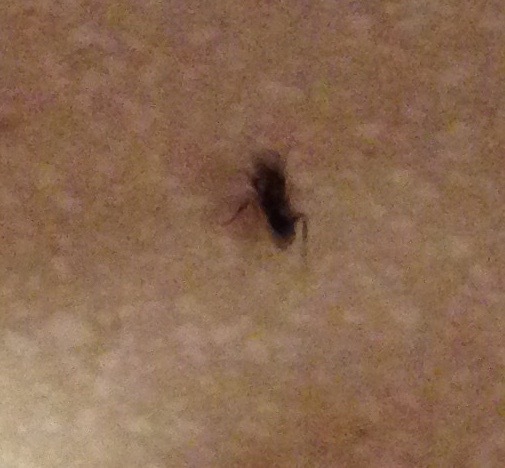 Well, no tour of our kitchen would be complete without the inclusion of our little kitchen friends, the ants. And the gnats, but they’re too small and too fast to snap a photo of. Off the kitchen is one of our five decks. 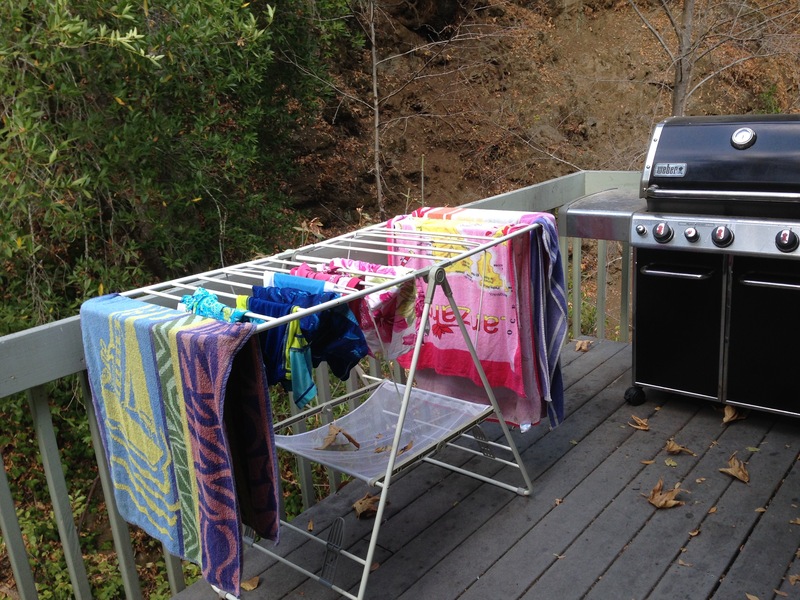 This one is currently housing our BBQ…and a drying rack with our swim gear. Notice the utter lack of grown-up bedroom furniture. We had sold half of our bedroom furniture before we moved to Ireland, and then we sold the rest of it this summer so we wouldn’t have to move it. This was before we realized that we actually need bedroom furniture for absurd purposes like HAVING FURNITURE TO USE. Our mattress is currently sitting on the floor, I’m using a Rubbermaid container as a night stand, and I literally found Jon’s nightstand in a dumpster. It’s actually pretty cool, because we feel like we’re in college again. 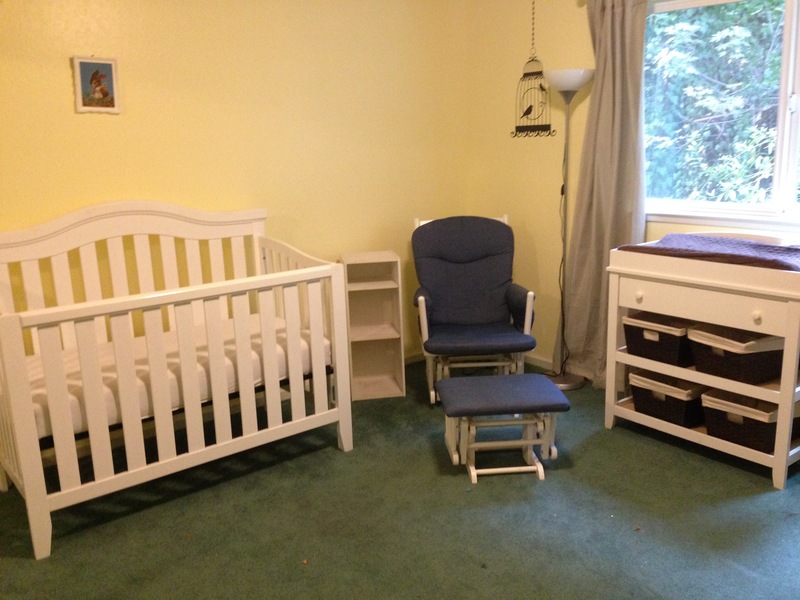 Not to worry, though, because our real Grown Up furniture has been ordered and is en route as we speak (!). From the bed you can see our two private decks and gas fireplace–once you look past the Rubbermaid nightstands, it’s quite the retreat. The white door you can see to the left of the fireplace is our closet. It’s a massive closet with ample storage for our clothing (and our full suitcases and boxes full of clothing, because it turns out bedroom furniture like dressers are actually useful for things like holding your clothes). Continuing on through the master suite you come to the master bath. 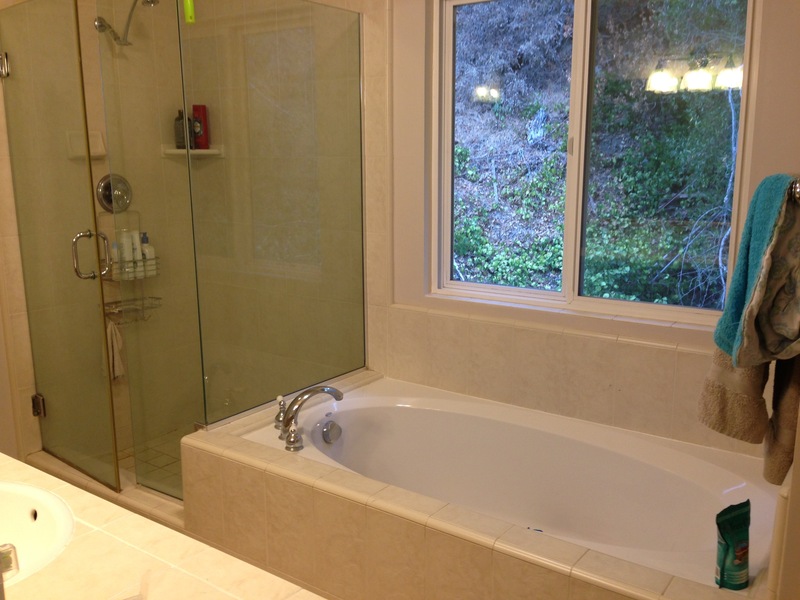 The soaking tub is so inviting to my achy pregnant body but, unfortunately, I can’t use it. I don’t know if you’ve heard, but California is in a DROUGHT, which means there are water restrictions in place. And by water restrictions, I mean our mountain home is basically siphoning water from the city through a straw and if we go over our allotted amount, the water police will come knock down our front door. And they’ll fine us thousands of dollars, but whatever. Alas, the soaking tub will have to wait. Finishing up the tour of the master suite is our…office corner? I don’t even know what to call it. We have a dresser, filing cabinets, boxes of crap we don’t want to unpack, a bookshelf, school stuff, and a random office chair (with no desk) crammed in there.At least there’s a pretty little deck to go stand on if you want to get out of the mess! This is also where we house our modem (for the world’s slowest internet) and our landline telephone (because we don’t get cell phone reception at the house). See, it really is like we’re in college again. That wraps up the top floor of the house! Now, down to the first floor. 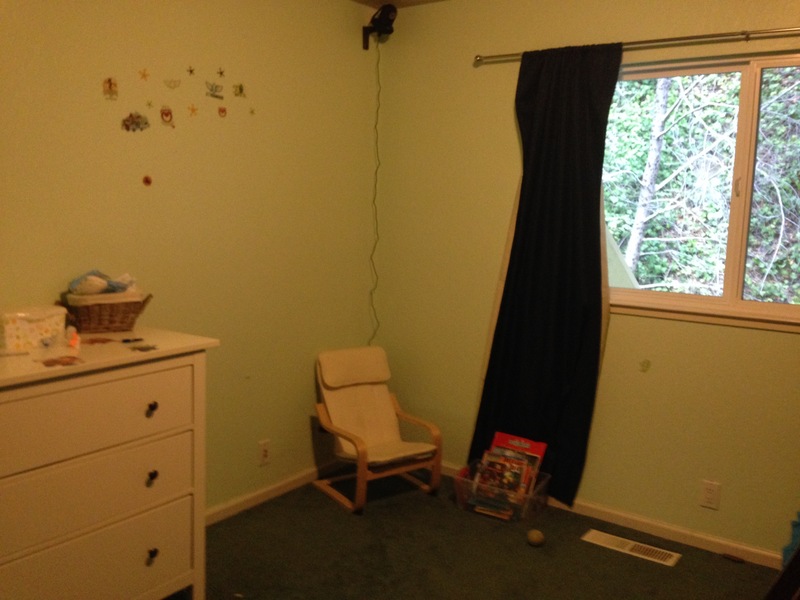 The boys’ bedroom is the first room you come to at the bottom of the stairs. 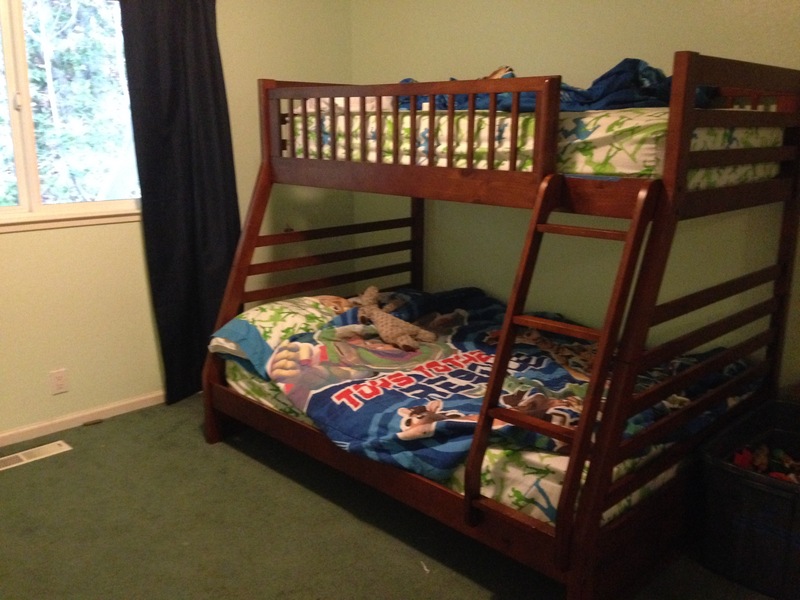 We have their bunkbed set up so they can practice their climbing and diving skills from more precarious heights. Opposite the bunk bed is the boys’ dresser and reading corner. Pay special attention to the most important addition we’ve made to the bedroom: our eye in the sky camera. Since the boys are now residing on a different level of the house from the parents, we considered it prudent to install surveillance apparatus. 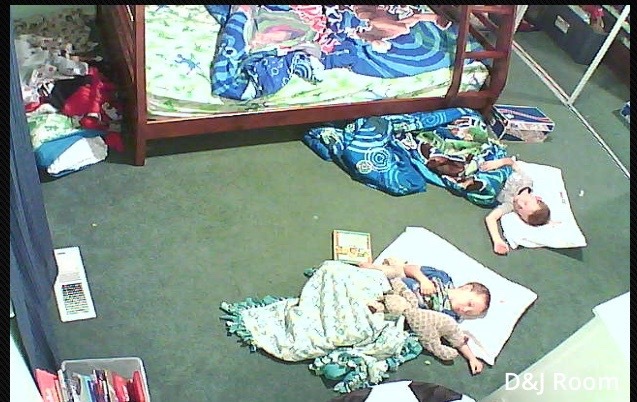 The camera allows us to capture all of the bedtime moments when the boys are anywhere but in their beds. 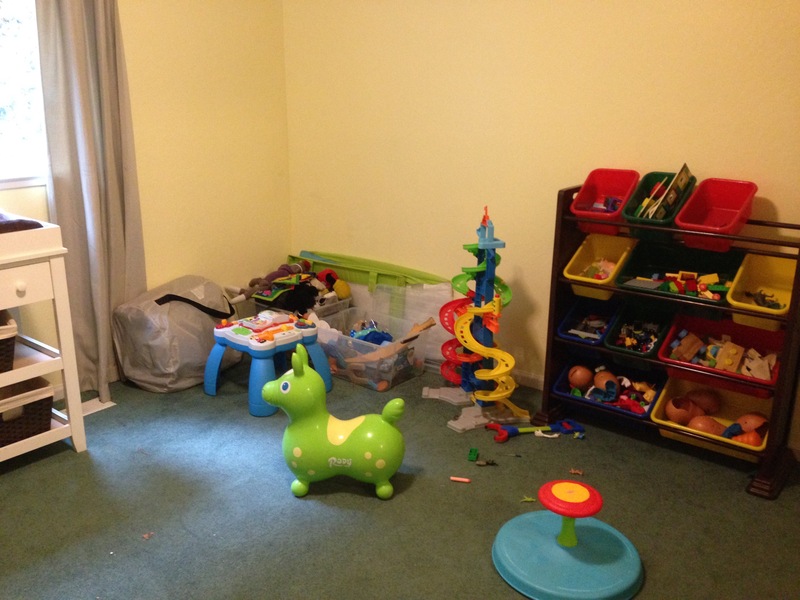 The opposite side of the room is currently acting as the boys’ play room (because this room has a door that locks, thus containing the mess and the temptations). 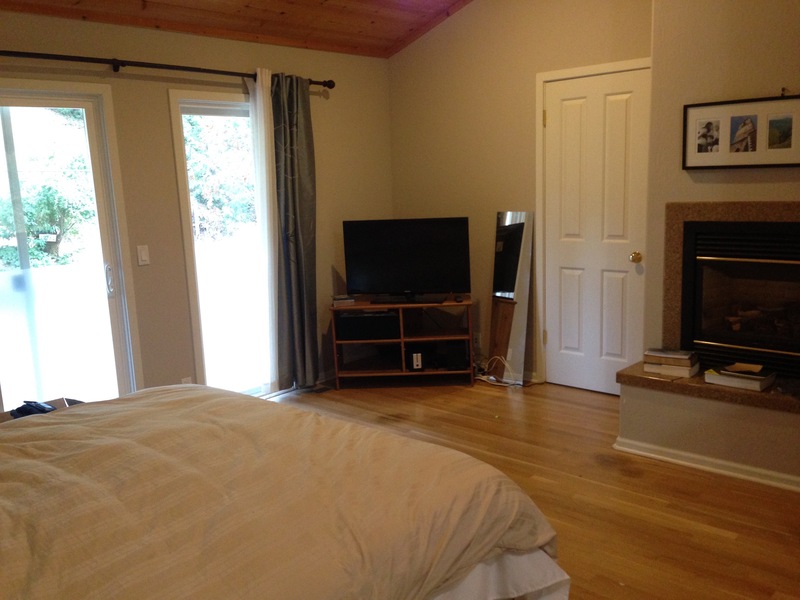 (Not pictured: the center of the room, the “guest room”, where we will set up our blow-up air mattress for anyone who wants to brave a visit). 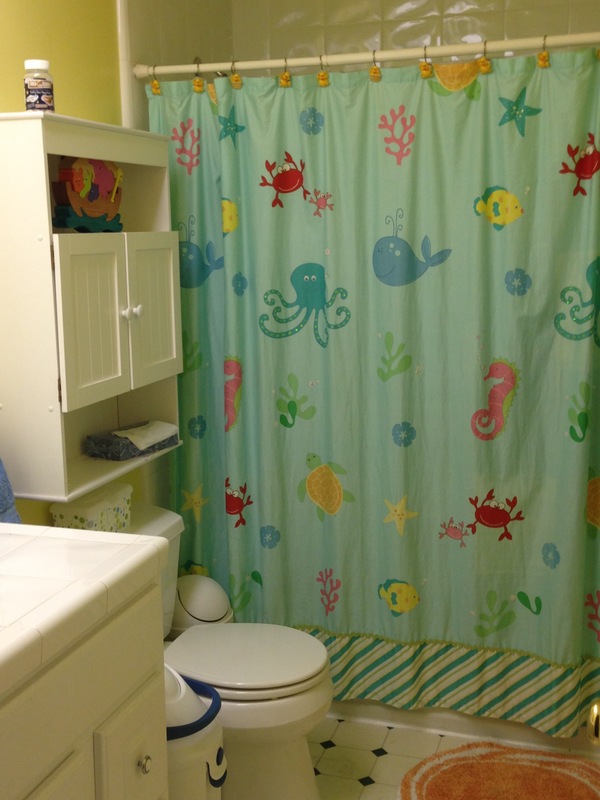 Also downstairs is the boys’ bathroom. It’s cute, but it smells like pee, so I try not to go in there. 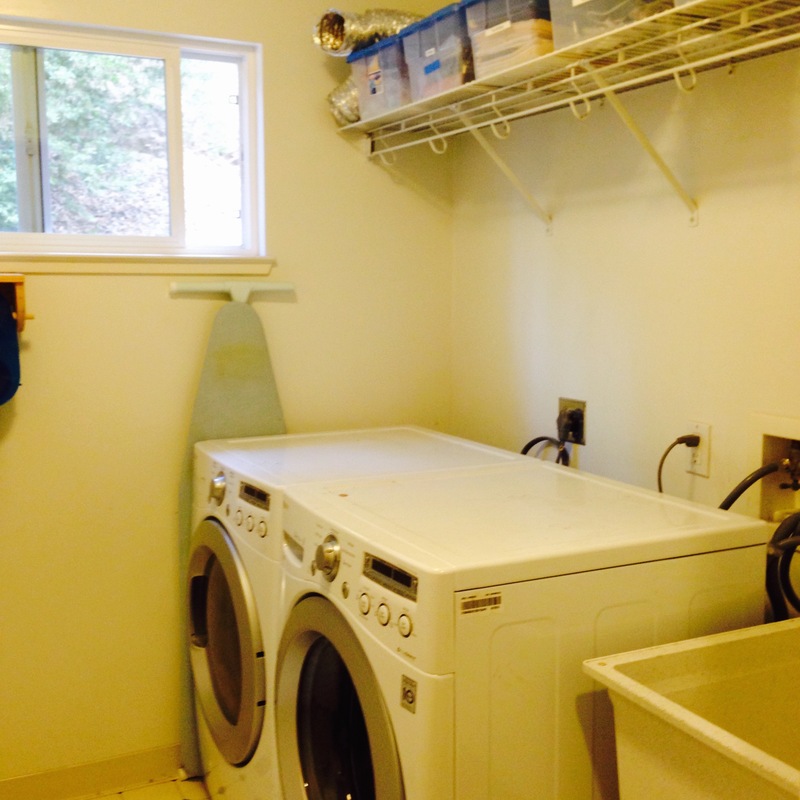 We also have a lovely laundry room downstairs with a utility sink (an absolute necessity with children, I’ve decided). 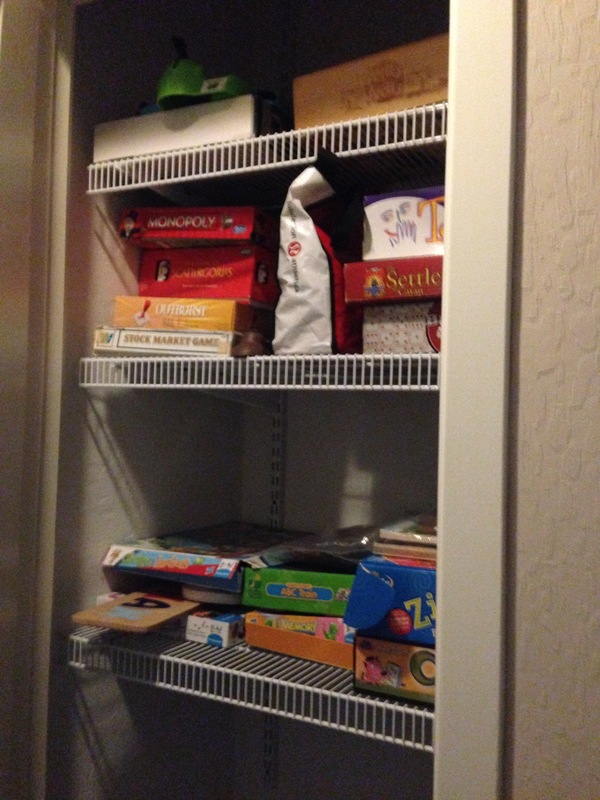 Outside of the laundry room is a linen closet and our game closet. We rarely play games, so I find it absurd that we own this many. Anyone want to come over for a game night soon? 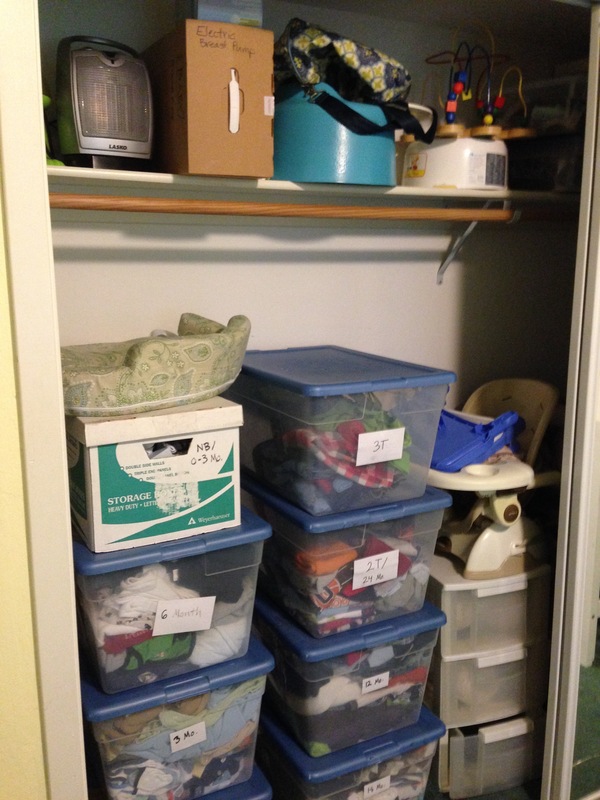 If you go down the hallway past the laundry room you come to our garage. 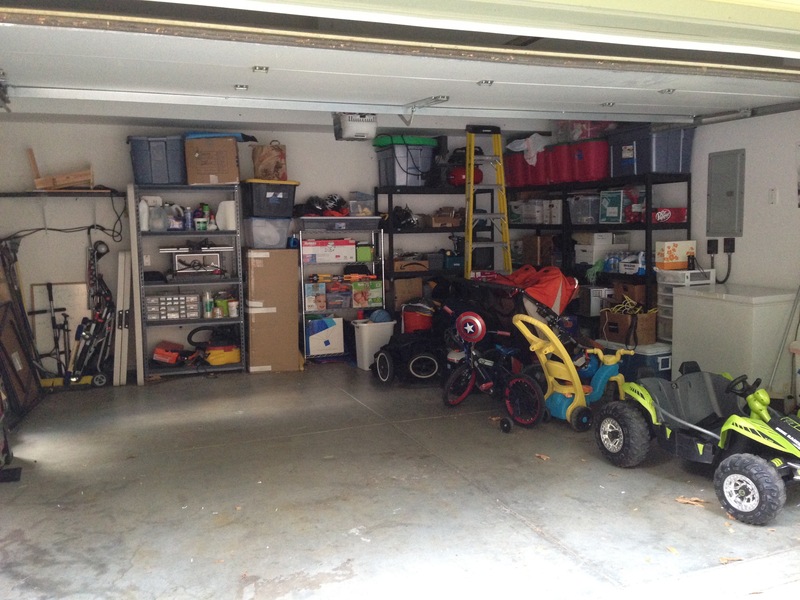 It’s pretty well organized with storage along the walls, infinity toys on one side, and a narrow sliver of empty space down the other side where Jon can maneuver his car inside to park (it’s a very shallow garage, so it’s quite amusing to watch this transaction take place). Outside the garage we have our yard. Yup, that’s it. 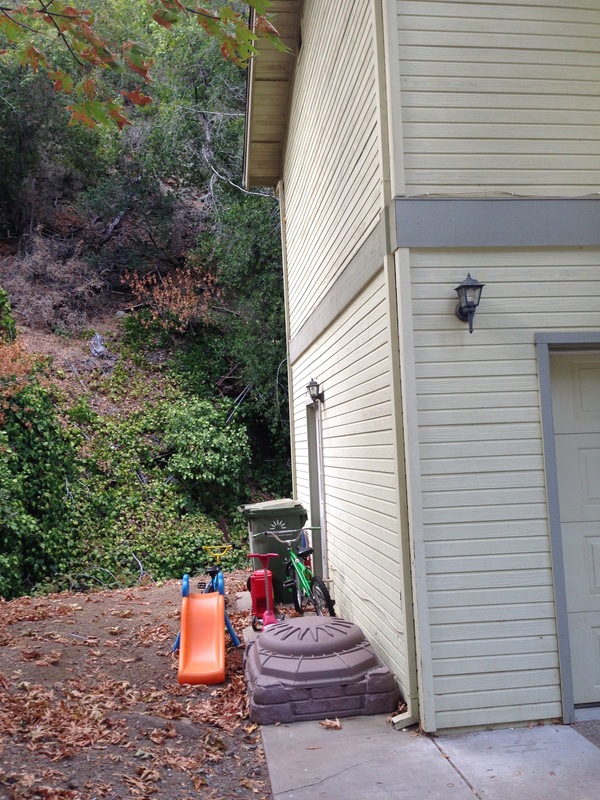 Our property line extends 6 feet on either side of the house and is backed by the (dry) creek and a canyon wall, so this is the entirety of our outside space. You may have noticed a wooden fence in front of the house (see the photo at the top of this post if you need a refresher), and you may have thought that was a nice little fenced-in yard. You would be wrong. What that is, my friends, is the propane tank enclosure. 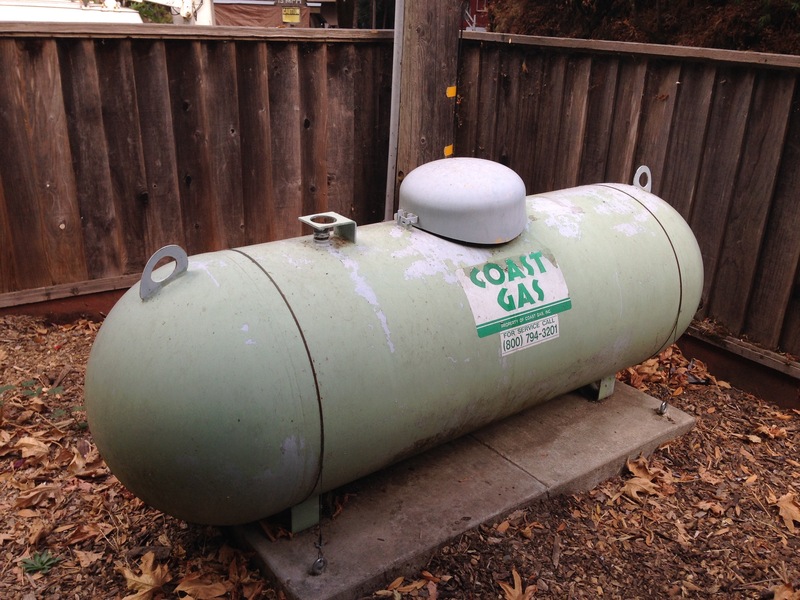 Because we live off the grid in the mountains, our main heat source for the house is propane gas (what?!?!). Since moving here, I have had to endure propane safety lessons with the gas company and join a propane users support group. True story. Thankfully it’s still FREAKING 100 DEGREES EVERY DAY HERE, so we haven’t had to try out the whole propane gas heat thing yet. Now, I mentioned earlier that the fireplaces were important, and now you know why. With propane being our main source for heat, and propane being VERY EXPENSIVE, we are told that we will be relying on those fireplaces more and more as the seasons change. 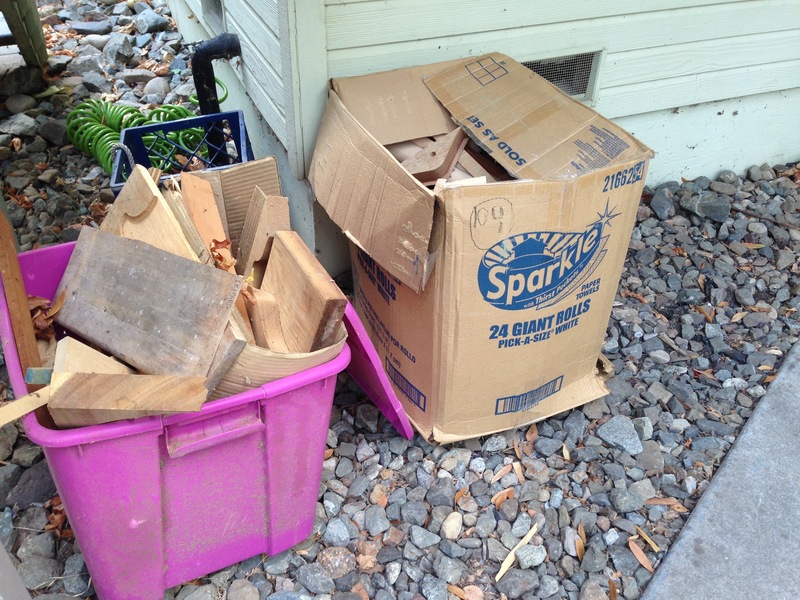 As such, we are stockpiling wood scraps and collecting them in aesthetically-pleasing boxes around the outside of our house. You’re welcome, neighbors. 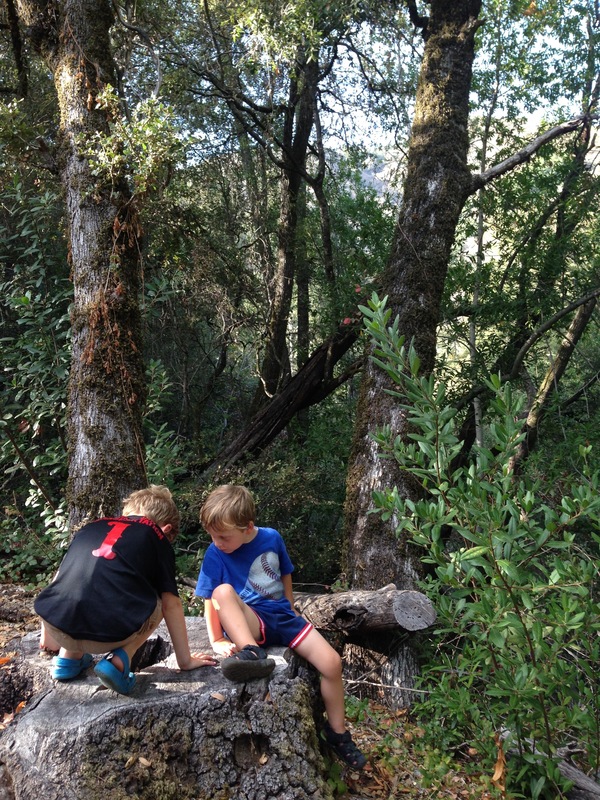 We have woods and canyons and creeks to explore. It feels very much like the Northwest, and very much like home. 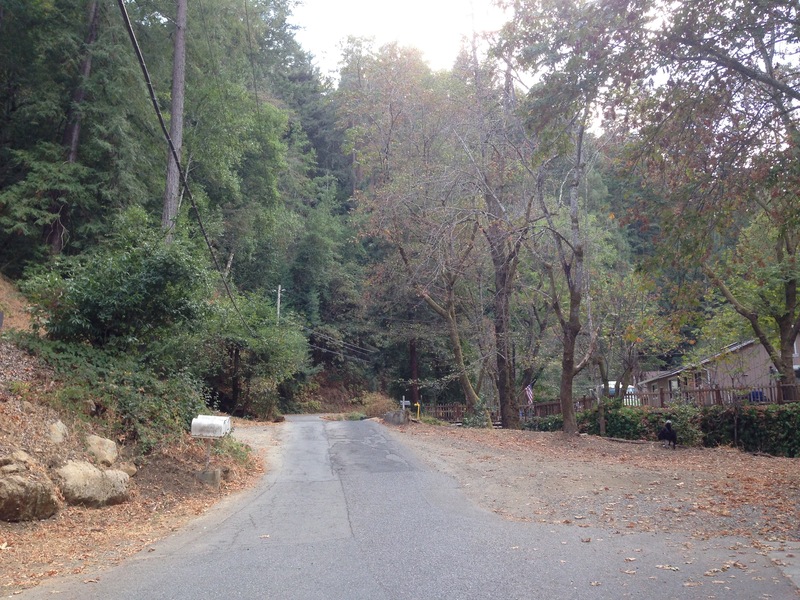 And, though you can’t see the houses or the people very well in this photo, we have incredible neighbors. Neighbors who invite us over for dinner and let us borrow their fridge when our fridge dies and who invite us over for bonfires and s’mores and whose kids have Power Wheels drag races with our kids in the street. The neighborhood is teeming with children the same ages as our boys and we’ve all made fast friends. 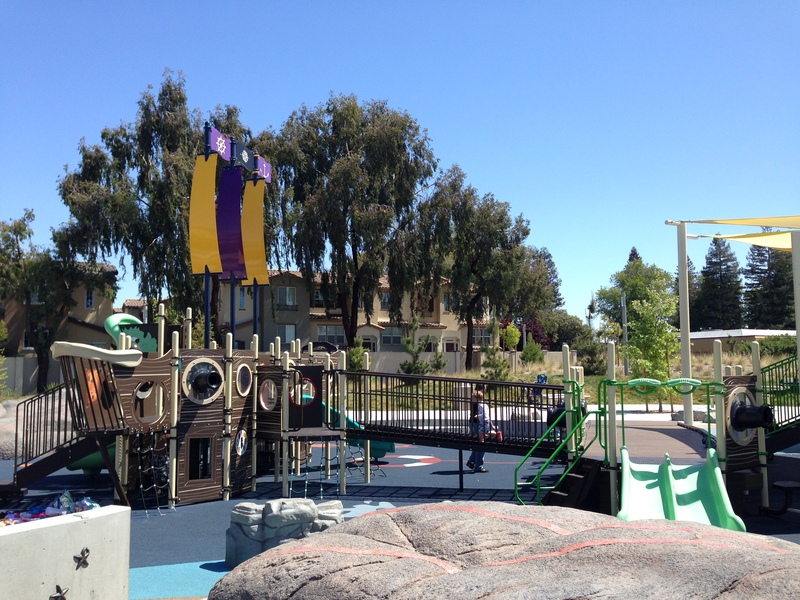 It’s a wonderful tight-knit community, and we feel lucky to live here. 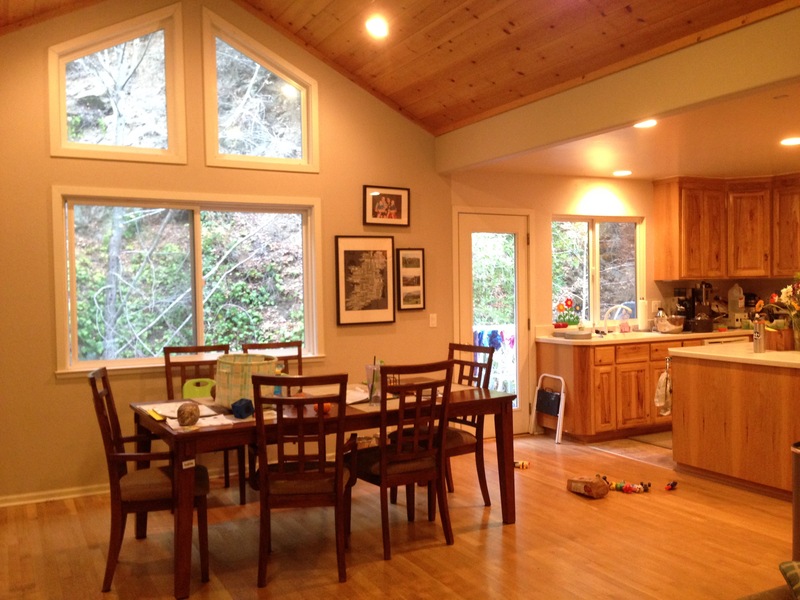 I hope you’ve enjoyed your tour through our mountain home, and let us know when you’re ready for a visit! I’ll even blow up the air mattress for you. Whoever decided that it was a good idea to market tiny plastic land-mines-disguised-as-toys to children has got another thing coming to them. I would like to suggest that, before they release a play thing to the free market, all manufacturers should submit themselves to case testing where they are blindfolded and forced to walk barefoot through a room littered in their creation. I can not even tell you how many times I’ve bruised my bare foot on a forgotten Lego or tripped over a miniature plastic army guy on my way up the stairs. I swear, tiny plastic toys are designed with the express intent of inflicting physical pain on unsuspecting parents. I’m coming for you, Mattel. We have a house rule that whoever uses up a roll of toilet paper must exchange the empty roll for a fresh one. It’s a common courtesy so that nobody is ever left high and…ahem…NOT dry. Clever people in my house (names withheld to protect the innocent) have found a way around this: just leave one square on the roll. I mean, I get it. They didn’t use up ALL the toilet paper–why on earth should they be expected to replace the WHOLE ROLL? After all, one square is a totally acceptable amount of toilet paper to handle any and all potential bathroom needs the next patron might have. God has blessed us with this incredible invention that has revolutionized modern life: the dishwasher. All you have to do is 1) Put your dirty dishes into the dishwasher 2) Pour a little soap into the dishwasher soap receptacle 3) Push a button, and 4) Come back an hour or so later to racks full of pristine dishes. Simple as pie, easy peasy–right? Wrong. As it turns out, step 1) Put your dirty dishes INTO THE DISHWASHER, is mind-blowingly difficult. Approximately 99.9% of the dirty dishes in our household migrate to the counter directly above the dishwasher, and there they sit indefinitely. I can only assume that last bit of opening the dishwasher door and shoving the dishes inside is an overwhelmingly taxing expenditure of energy. My poor family could not possibly be expected to put themselves through that misery. Bless them, they must know deep down in their hearts how much I love the challenge of moving dishes from the counter into the dishwasher, and I can only express my most sincere gratitude to them for helping me to grow in this area. I would totally avoid this one if I could, but for some reason all of these little mouths keep wanting to be fed. And so, the grocery store must be addressed. Grocery shopping with children is like playing Russian roulette: when you win, you win BIG but when you lose…well, just don’t ever lose. Throwing kids into the mix means you almost always lose at the grocery store game: Have all the children already eaten, slept, and pottied properly? How is the general mood of my offspring on this fine morning? Where do I put the kids–walking with me so that they knock over every display in every aisle we pass through, or in the cart so that I have nowhere to actually put the groceries? Will my toddler throw a tantrum in the middle of the produce aisle? Will my 4-year old swipe cake decorating supplies (again) and stash them in his pocket, only to be discovered once we have safely returned home? Will the forbidden candy in the check-out line incite the next civil war in the middle of my shopping cart? Did I remember my shopping list, my reusable shopping bags, my coupons, my diaper bag, my wallet, my sanity? And, if we actually make it through the store in one piece, there’s always the check-out line to look forward to. Because if there is anything I can predict with 100% accuracy on a shopping trip with kids it is this: I will always choose the slowest line. All I can say is praise you, sweet Jesus, for Amazon Prime and Safeway home delivery. There are two problems with itty bitty socks: 1) Itty bitty socks are specifically designed to fall off itty bitty feet, and 2) Itty bitty socks are polarized so that no pair of socks that enter a washing machine may ever exit together. I have baskets and bags and bins full of itty bitty socks that have been found lying off-foot or that are anxiously awaiting the joyful return of their partner. 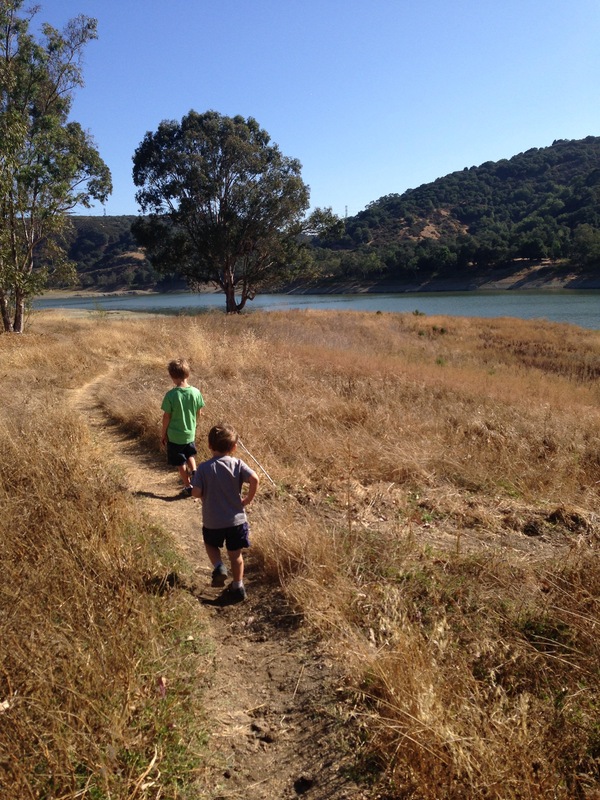 Thank goodness we moved to California so I have a decent excuse for why my children are barefoot year-round. 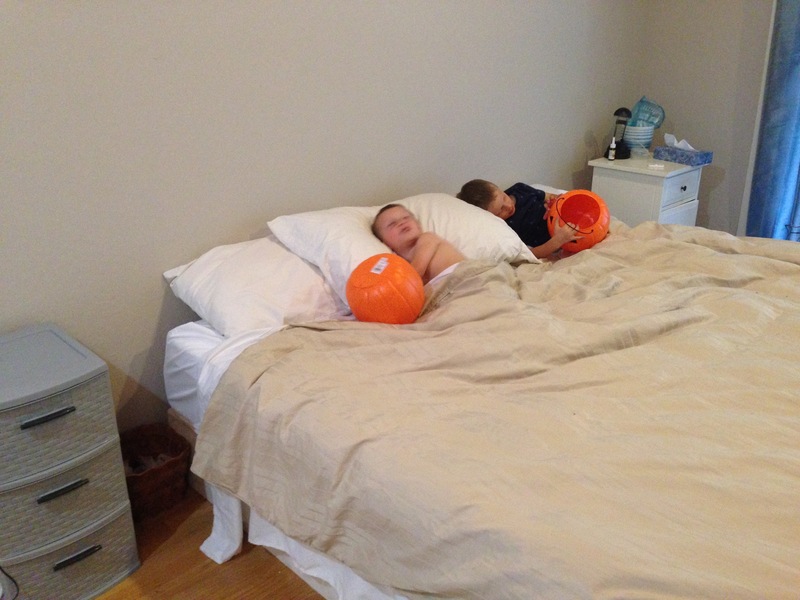 Fact: 90% of parenting revolves around an attempt to control your childrens’ sleep. Children either won’t sleep when you want them to, or they will sleep when you don’t want them to. It’s your 2-year old’s nap time and you absolutely positively need to return a critical phone call and fold that growing pile of laundry without “help”: guaranteed he’s climbing up your leg instead of nodding off. Your fridge broke over the weekend so you’ve been without perishable foods for the past 3 days, and now that a new fridge has finally been delivered you absolutely positively must go to the grocery store (your favorite place!) 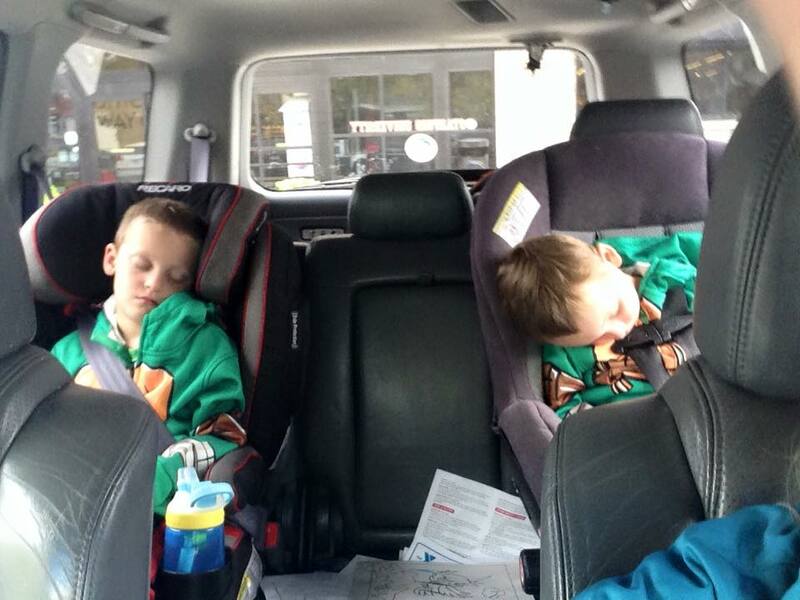 for eggs and milk: guaranteed your 3-year old (who rarely naps any more) and your 4-year old (who hasn’t napped in 2 years) will both fall asleep in the car on the way to the store thus making it impossible to complete the task at hand. It’s 9:00 and you’ve had ONE OF THOSE DAYS and all you want to do is curl up in the fetal position and binge watch HGTV: guaranteed the kids get out of bed 5,000 times. You have 15 minutes to get the kids changed, snacked, and driven to the pool for swimming lessons: guaranteed your preschooler is passed out in a state of hypnosis that can’t be shaken. Guarantees in parenting are few and far between, but at least we can be assured that some things will remain a constant: those things that drive us nuts. In the end, I guess I will just have to learn how to deal with my own mommy pet peeves–perhaps while wandering kid-free through an empty grocery store with a Starbucks hand. Can you believe it? Summer is OVER, and hi-ho-hi-ho it’s back to school we go. Back-to-school is always a special time of year, but this year is totally unique for us as it will be our inaugural year of homeschool. The butterflies are stirring. Even though I’ve formally been out of the classroom for the last five years, I still suffer from Teacher Complex A. I can’t walk by the school supply aisle in a store without stopping to ogle the newest offerings, and I have a strong affinity for paper cutters and laminators. I speak in my Teacher Voice when I mean business–even with other grown adults. 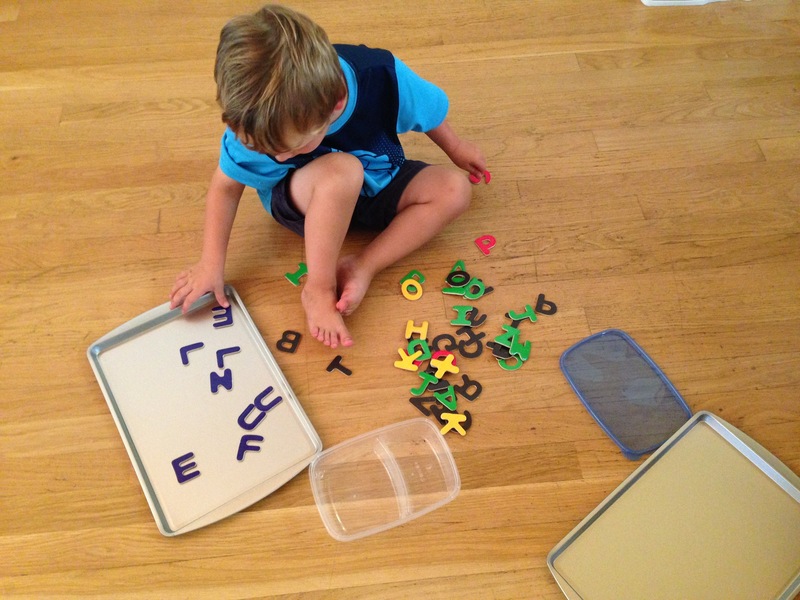 I’ve been known to opt out of traditional home décor in favor of colorful die-cut shapes so we can practice our letters and counting skills. You can take the teacher out of the classroom, but you can’t take the teacher out of me. You can imagine how giddy I’ve been these last couple of weeks, then, as I’ve eagerly set up my own classroom at home (and by classroom, I mean I have completely taken over the entire house). This was no small feat considering we just moved into this house a 12 days ago, but where there’s a will there’s a way, amirght? 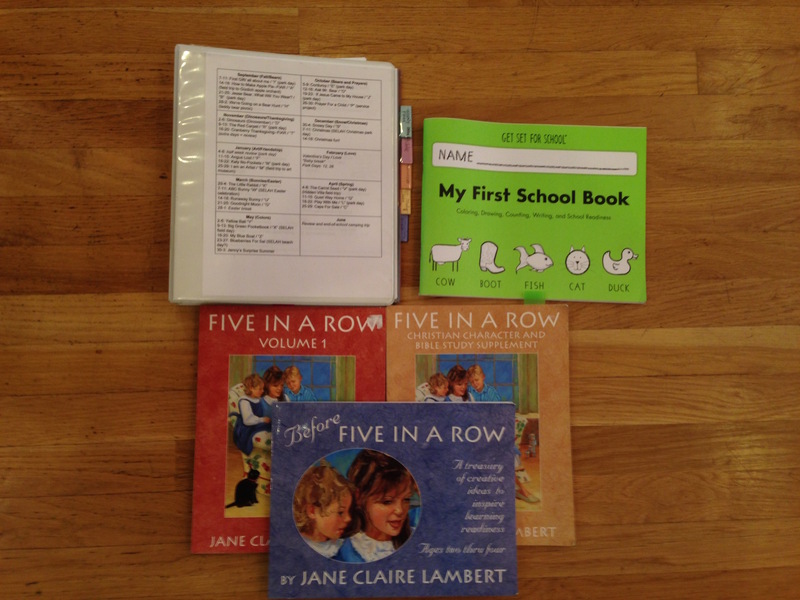 This year we will be using a curriculum (and I use that term lightly) called Five In A Row (FIAR). After reviewing the first volume of FIAR, however, I decided that Before Five In A Row (BFIAR) would be a better fit for us this year since most of the FIAR lessons are geared toward early readers and writers and we’re just not quite there yet. Each week we will read a different classic children’s book (think Going On A Bear Hunt and The Runaway Bunny) every day for a full week (five days in a school week = five in a row). The curriculum/guide suggests learning activities across all subject areas that go along with the themes of the story. 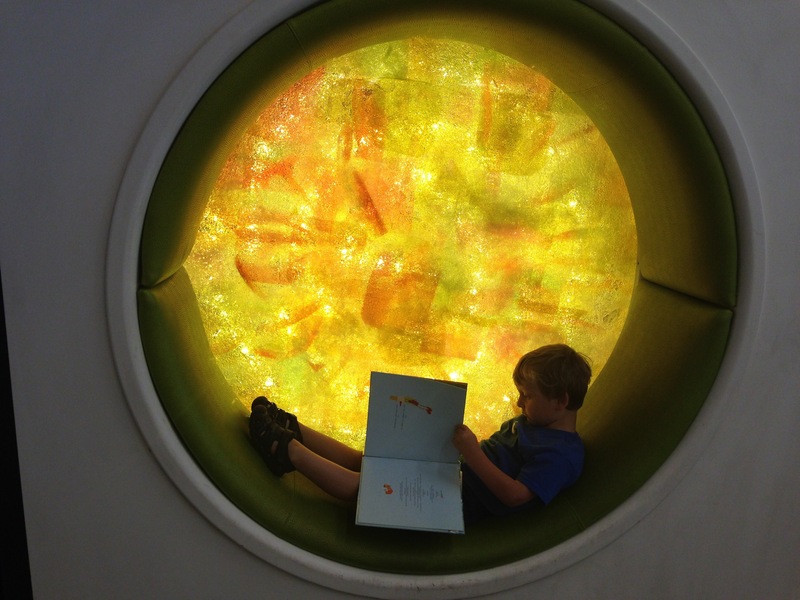 This is called a unit study approach, and I really like this idea for my multi-age preschool (see how fancy we are here at the Peterson Learning Academy?). 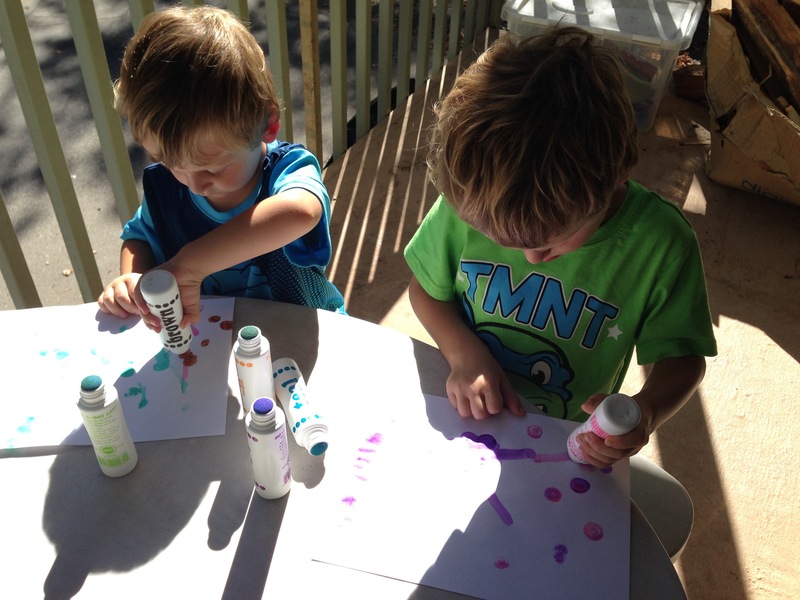 FIAR allows me to adapt ideas to meet the interests and needs of both boys while keeping the focus on hands-on activities (I have a strong aversion to worksheets and rote seat work for kids of this age, but we can get more into that later…). I will also be supplementing a the BFIAR guide a bit as I find necessary. For Bible I plan on using the FIAR Bible Study Supplement, The Jesus Storybook Bible, and Five Minute Devotions for Children. For handwriting practice (for David only) we’ll use the Get Set For School My First School Book by Handwriting Without Tears. I made my own planning notebook because that’s just how I’ve always done it and it works and I like it. As far as the classroom goes, we have several spaces to choose from. I’m sure as the year goes on I will see how each space works best and we’ll move around all day as it suits us. 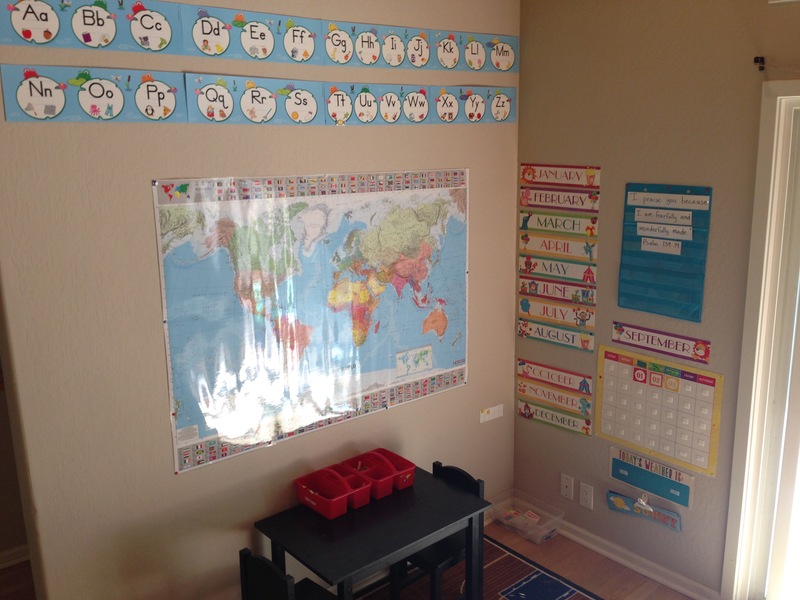 This is our learning corner where we will do calendar/circle time and work on projects at the boys’ small table. 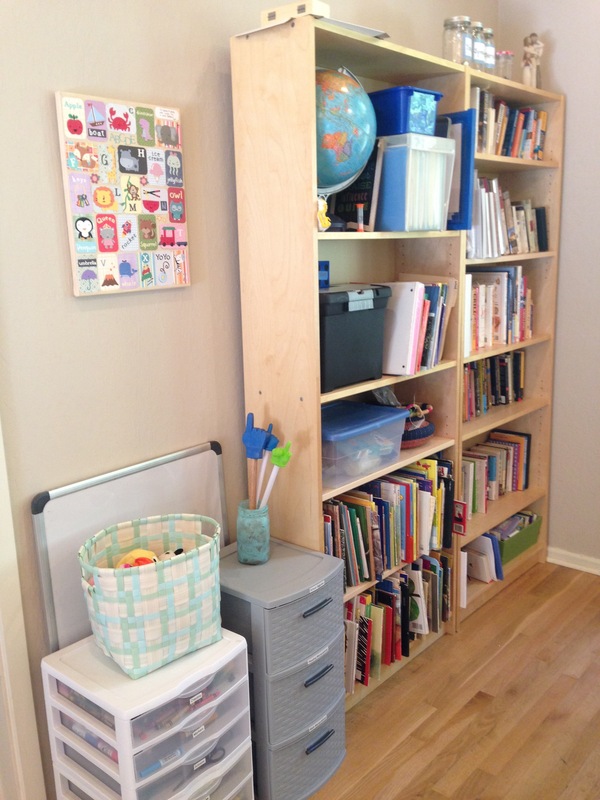 I also set up some bookshelves and storage on the opposite wall so I can keep books and supplies at the ready. 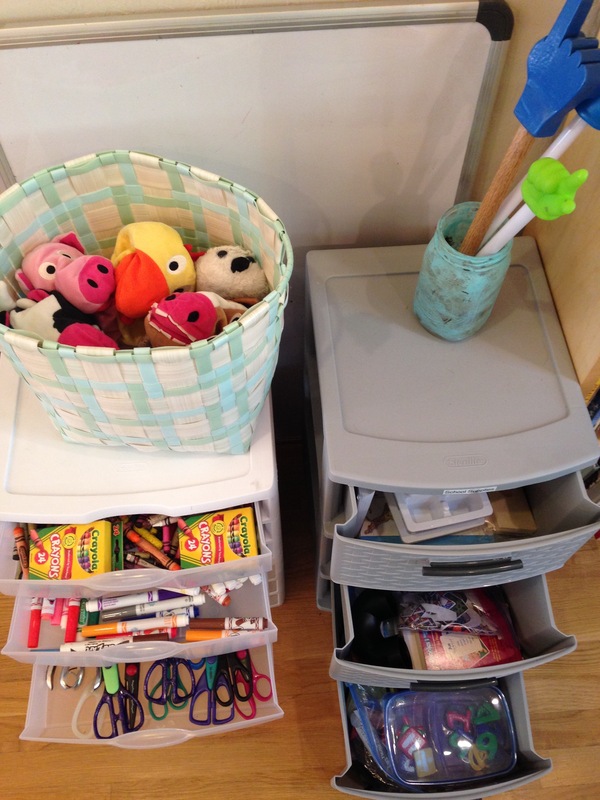 The drawers next to the bookshelves contain supplies (crayons, markers, scissors, glue, tape) and manipulatives (teacher speak for Stuff We Use…letter and number magnets, big foam dice, ice cube trays for sorting activities, blocks, felt board pieces, puppets, pointers…all kinds of goodies). 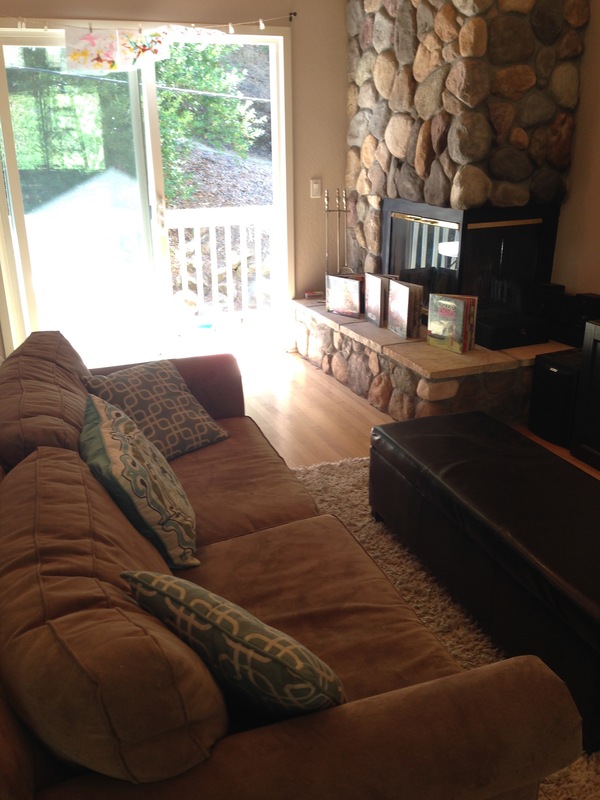 The living room just happens to be in the center of our learning space, so we’ll use the couch and fireplace for story time and cuddle breaks. Our dining room table will be another great workspace since we can clear it off and have plenty of room to lay out projects. 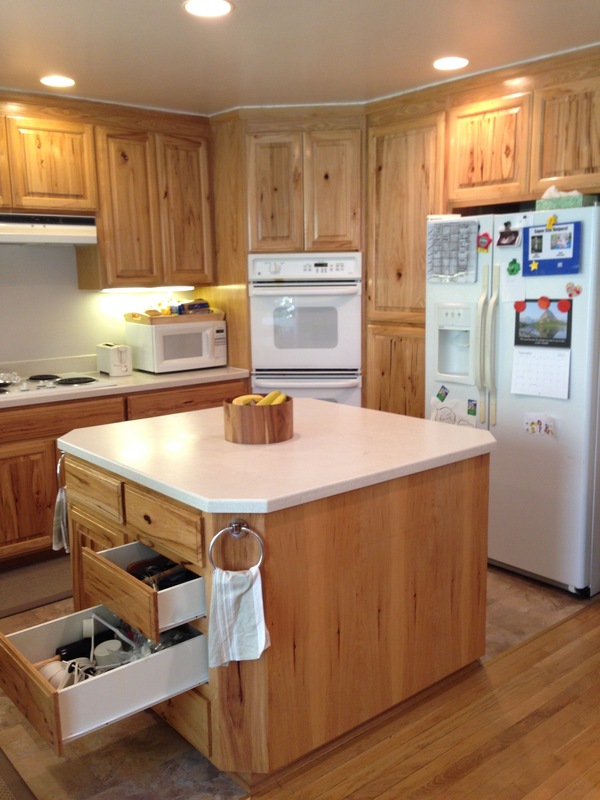 The kitchen will play a big role in our learning adventures this year. I plan on doing at least one cooking project each week that goes along with our story, so I wanted to make sure the kitchen was accessible for the boys. 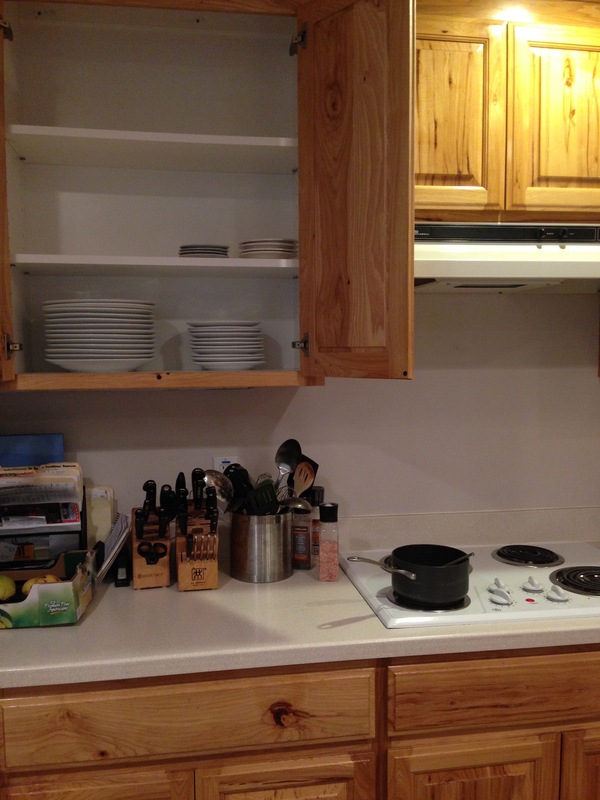 I dedicated several lower drawers to the supplies they’ll be using most often in our cooking: measuring cups and spoons, baking dishes, bowls, and cutting boards. Perhaps what I’m most excited about, as far as the actual learning space is concerned, is the fact that we will have nearly unlimited access to the Outdoor Classroom (thank you, California sunshine!). 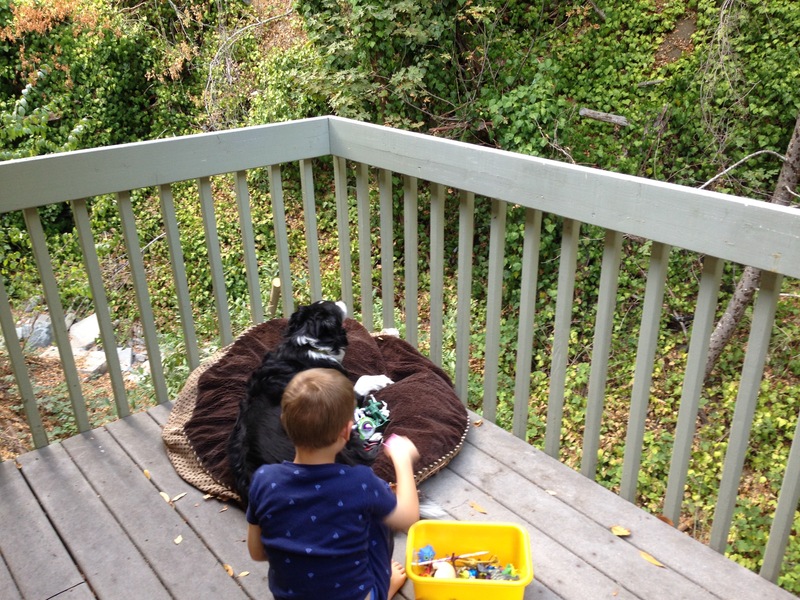 One of our decks will host our outdoor learning stations: a sensory table (designed and built by Jon, our resident playtime architect and Principal Daddy), the “Play Doh Table”, and a big tub of plastic toys and Play Doh tools (plus a comfy chair for Teacher Mommy). 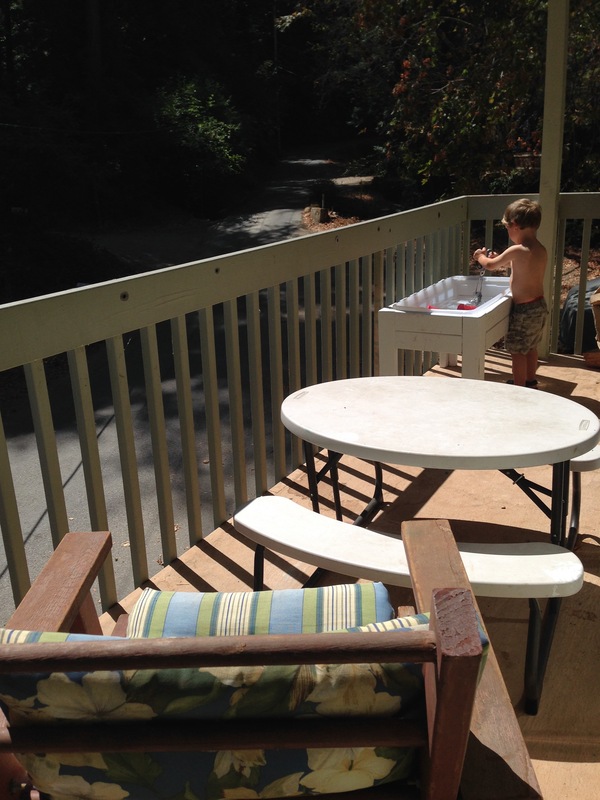 Our new house is in an awesome location for outdoor explorations. 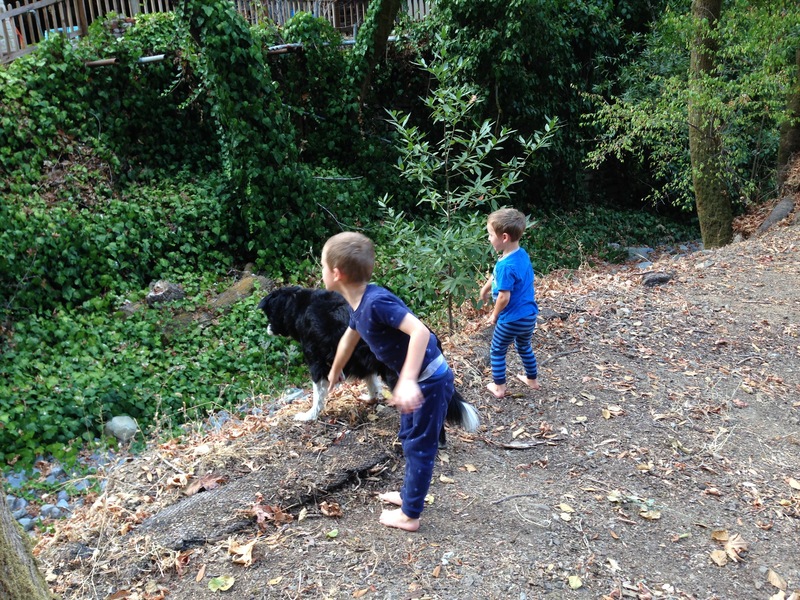 We live in a mountain canyon with a creek in our back yard–what else could two little boys ask for? 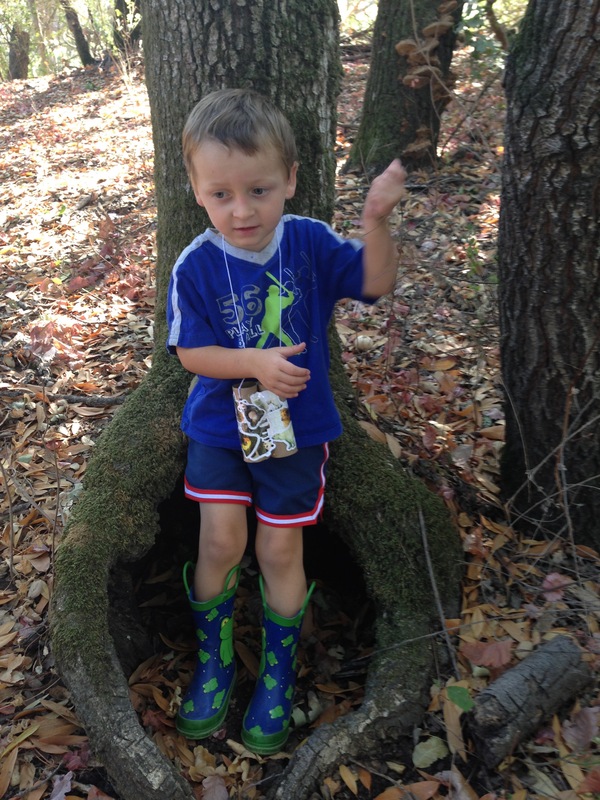 We will spend plenty of time out in nature exploring and using our senses as we learn about the world around us. Right up the street from us is a large lake with trails and beaches. Yet another exciting venue to explore in our outdoor classroom. Since reading books will be a big part of our year, we will also be spending plenty of time at our local library enjoying books together. I’ve joined a local homeschool co-op that a fellow homeschooling friend of mine is a part of, and we’ll be having weekly park days and field trips throughout the year. Not only will the park days and field trips be fun for us, but they will also give me and the boys an opportunity to connect with our peers. In addition to the co-op, we’ll also be attending MOPs (Mothers of Preschoolers) or CBS (Community Bible Study) each Wednesday morning, and AWANA on Sunday evenings. We’ll have quite the varied schedule, but I’m sure we’ll never get bored! I can’t wait to see what this year has in store for us as we embark on this new homeschool adventure together–wish us luck!